just a few things -- the crank position has 3 only pull out and reinstall. After that it needs to be replaced with a brand new --- regardless. also make sure your fuel pressure dampner internally is super spotless clean and rail lines to it. Paint and or fuel varnish and or rust really can settle in its base and in the dampner itself plus its small rail lines. Just some added info. The dampner will have U clip for a hold in place and 2 O rings internally and has to SEAL 100 percent. The 2 o rings can also become dried out and or cracked. The 2 O rings alot of times will need to be changed out with new. Sometimes not but alot of times YES they will need to be changed. John, thanks for the tip. When you had my injectors, I went thru the fuel rail. Cleaned internally. No more paint in the gen 3 fuel box should make for less headaches. Went ahead and installed a new camshaft position sensor as well. Easier access now. Going to clean up the bilge and drop it in. met to say the crank position SENSOR is only a 3 pull out / reinstall after that needs to be replace regardless. The fuel pressure dampner HOUSING is a dumping ground in there for all kinds of crap including RUST and PAINT. The fuel will vanish in there as well. Just saying to be clear about that one. Man that 3 pull out and reinstall sure does not sound good for dudes - with that practice prob many little ones on the way. Ryan00TJ, Sunny32SSR and AusScarab29 like this. She's back in. Going to test fire in boat and then pull risers and weld in 02 bungs. Maybe a water test in april/may timeframe. You are way past it but for what its worth in the future, dont run it on the floor on the oil pan. Throw a block of wood under the front. When I was testing mine I had stall issues and slight reversion issues only to realize sitting on the floor on the pan has nowhere near the angle of when its in the boat. Back in the day of Ray @ Raylar it took 3 phone calls to finally realize that is a big no-no. Air tubes part of the VR1 package if I;m not mistaken, A bunch of things like this is why these boats are so damn fast for the power used. On the 280 s the air ducks are further back and not as far into the engine - kind of a short snub version for the 280 s. The 290s are that way in the pic or least the ones I seen. Keith, Your right it's definately flat sitting on the built in oil pan stand. I can see where a bigger cam could cause reversion. Velocity claimed the "Ram Air" tubes pressurized the engine compartment to 3.5-4 psi and kept temps under 100*. I've cracked the hatch and put my hand in there cruising 45-50. There's alot of air coming in! Scott, Appreciate it! Hope to burn lotsa fuel this summer!! We use to test the engine compartments temps all the time. 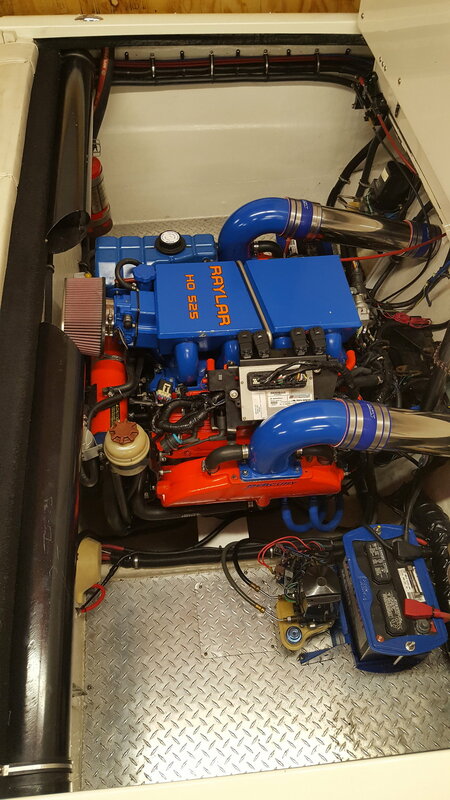 Actually many years ago being a dealer for new boats we use to have to rig the whole darn boat - We pick the engine packages and drive and so on - then cut the darn hole and go to town installing alot of systems to the brand of hull. Anyways how I use to test the engine compartment temps way back in the day ( and Merc wanted you to as well ) was with a outside temp monitor aka outside weather monitors. Of course today there is alot on the market to test temps with and even measure air flow. Last edited by BUP; 02-11-2019 at 10:50 PM.